We moms can use all the support, whether we’re willing to admit it or not. No matter all the pre-planning before baby, nothing can prepare you for motherhood. Each baby is different, each woman so unique. Though similar our experiences may be, they are all individually distinct. Sometimes, all we need to snap us out of a frustrating day with baby is good old-fashioned laughter. Surely this new web series about new mom-hood by the talented Chantelle Tibbs will do just the trick. 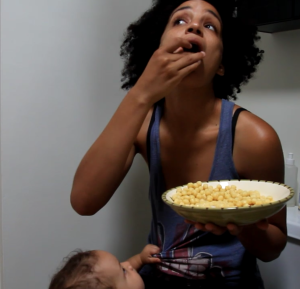 New mom and actress, Chantelle Tibbs plays Ana, an ex touring musician and new mom in the new web series, MILFY. 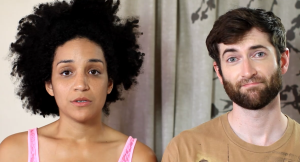 The series follows the life of Ana, her live-in boyfriend James and their 14 month old son, Kai (played by Chantelle’s son Kai Ryu Tibbs-Mendoza.) Ana speaks about the life of unexpected motherhood and the drastic changes from her old lifestyle. From making new friends, to breastfeeding, to romance, Ana fumbles her way through new territory. To add to MILFY’s unique perspective Chantelle has gone above and beyond to hand pick advertisers she feels most moms will benefit from by bringing these companies into their homes and lives.